[Nyaung Shw e-7th July 2015] Ministry of Environmental Conservation and Forestry (MOECAF), the Norwegian Government through the Royal Norwegian Embassy in Myanmar and the partner UN agencies are organizing a consultation workshop on 7th July 2015 in Hupin Inle Khaung Daing Village Resort, Inle Lake, Nyaung Shwe to inform the Long-term and 5 Year Action Plan of Inle Lake Conservation to the Inle Lake stakeholders and to discuss the way forward for management and implementation of the Inle Lake Conservation. The Workshop was inaugurated by H.E. U Win Tun, Union Minister, Ministry of Environmental Conservation and Forestry, H.E. Ms. Ann Ollestad, Ambassador, the Royal Norwegian Embassy in Myanmar and was addressed by Ms. Renata Lok-Dessallien, United Nations Resident Coordinator in Myanmar. Over 100 participants including Senior officials from MoECAF and key line ministries, senior officials from Shan State Government, Parliament members of Shan State, civil society organizations and ethnic community groups, private companies, including the hotel and tourism industry, media, UN agencies, INGOs, local NGOs participated in the event. The workshop provides an opportunity to mark a number of important milestones for In le Lake conservation and restoration: the launching of the Long Term Restoration and Conservation Plan and the 5 Year Action Plan (2015-2016 to 2019-2020), the recent inscription of the lake as a Man and the Biosphere Reserve and the establishment of a lake authority. During the recent tour to Inle Lake, H.E. President U Thein Sein called for the collaboration of development partners for conserving Inle Lake as UNESCO Man and the Biosphere Reserve and encouraged to strengthen the implementation of the Inle Lake conservation in a holistic and cooperative manner. The Long Term Restoration and Conservation Plan of Inle Lake and the 5 Year Action Plan (2015-2016 to 2019-2020) are the outcome of the efforts of the Ministry of Environmental Conservation and Forestry, The Shan State government , civil society and other pertinent stakeholders, with technical support of UN agencies. 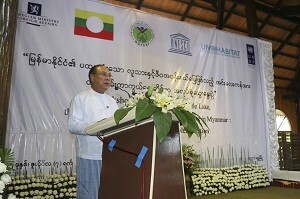 “I sincerely believe that both plans (long term plan and 5 year Action Plan) will play key roles for and be instrumental to integrated management of Inle Lake and its natural resources in harmony with the Man and the Biosphere Reserve (MAB) Programme” said Union Minister U Win Tun in his opening speech. “Conserving Inle Lake as the UNESCO’s Man and the Biosphere Reserve will also contribute to build peace, to eradicate poverty and to promote sustainable development of the local people” added H.E. U Win Tun. 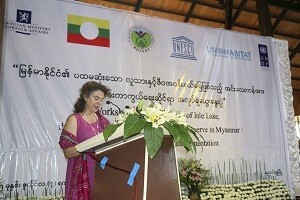 Ms. Ann Ollestad, Ambassador, the Royal Norwegian Embassy in Myanmar stated that “the most important work still lies ahead, and a holistic, long-term, cooperative approach is needed to save the lake.” The Ambassador hopes the new lake authority will have a strong mandate to direct, monitor and supervise the conservation and restoration work. She believes this will contribute to maximizing the outcome of joint efforts. She commended the achievement of these milestones and was also proud that Norway has been able to play an active role in the important work concerning conservation and rehabilitation of Inle Lake. In her openin g speech, Ms. Renata Lok- Dessallien, United Nations Resident Coordinator and UNDP Resident Representative, highlighted the important role of a responsible and accountable management body, and financial and technical resources for implementation of the Plans. “Equally important is the participation and collaboration of government departments across all sectors, civil society and the communities residing in the Inle area”, she commented in her speech. “The long-term plan is based on a Community Based Approach with the realization that no plan involving communities can succeed if the communities are not empowered to take charge as ‘owners’ and given a lead role in decision making with a wholehearted participation in the plan’s implementation”, said Mr. Bijay Karmacharya, Country Programme Manager of UN-Habitat. “We provided technical assistance to the Ministry in formulating the long-term plan the Ministry with financial support of the Norway Government”, he added. “The Lake was deteriorated as a result of unwise use of natural resources and due to the impacts of climate change. To revert this situation from depletion to conservation will take time for years. Now we have plans, endorsement of the Lake Authority. A long way ahead. Today workshop has proven a good start for the actual implementation. Let us put the Inle Lake Conservation Plans into practice and implement to achieve successfully to the objectives of restoration and sustainability of the Inle Lake. We look forward to collaboration and support of Union Government, Development partners and UN agencies.” said H.E U Sai Aike Paung, Minister for Ministry of Forestry and Mining, Shan State Government. Under the Inle lake Conservation and Rehabilitation project, implemented during 2012-2015 by UNDP with MOECAF with financial support of the Norwegian Government, the nomination of Inle Lake as the UNESCO’s Man and the Biosphere Reserve was prepared and submitted by the Government to the UNESCO MAB Programme. UNESCO provided technical assistant to the government in preparation for MAB nomination as well as in the technical assessments during the process. UNDP also provided technical support in strengthening Inle Lake Management Mechanisms through preparation of Terms of Reference for the Inle Lake Authority and knowledge exchange programmes with other countries. UNDP provided technical assistance to MOECAF and the Shan State Government in formulation of Inle Lake 5 Year Action Plan for Inle Lake Conservation (2015-2016 to 2019-2020).